Making inlays is a time consuming procedure but can be very rewarding when the composition comes together. Recently, I had a request to make a box using some Hazel and Oak. The use of these woods were important to this project insofar as the clients names were Hazel and Darragh (Dair being the Irish word for Oak). There was not too much hazel, just a couple of thin pieces, as shown below, right. As the inlay was to have some symbolic meaning, the composition reflects equal sized pieces of hazel and oak to represent the equality in their partnership. It was then framed with bog oak, some couple of thousands of years in age. This to reflect the solid eternity of their relationship. So this article shows a step by step tutorial in how to make the inlay and I hope it is of use in your next box project. 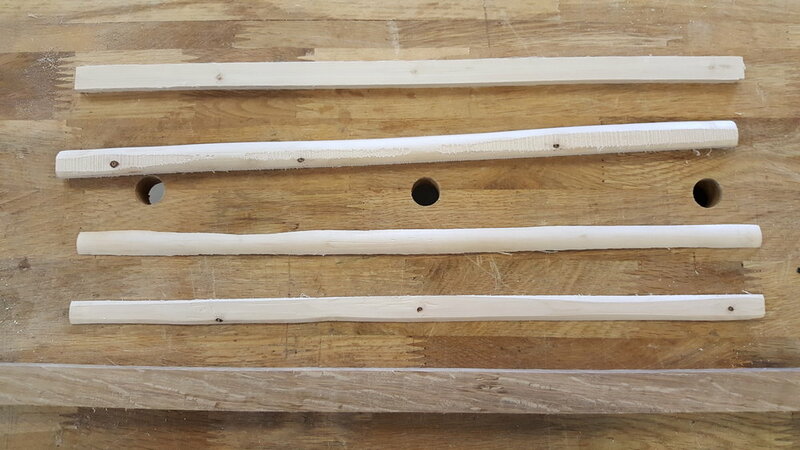 So, the first step is to try to make a square from the length of the hazel twig. As the piece will be round, use a block plane to create a straight flat surface and then using a band saw, create a square edged section. In this case approx. 10 x 6 mm. Select some oak, (try to find some radial cut, or quartered cut as this will reveal a very attractive end grain) and prepare an equal sized section. Ensure all sides are square and clean of saw cuts. This prep is important. Only a small amount of workable hazel was achieved so it is important to make every splinter count ! 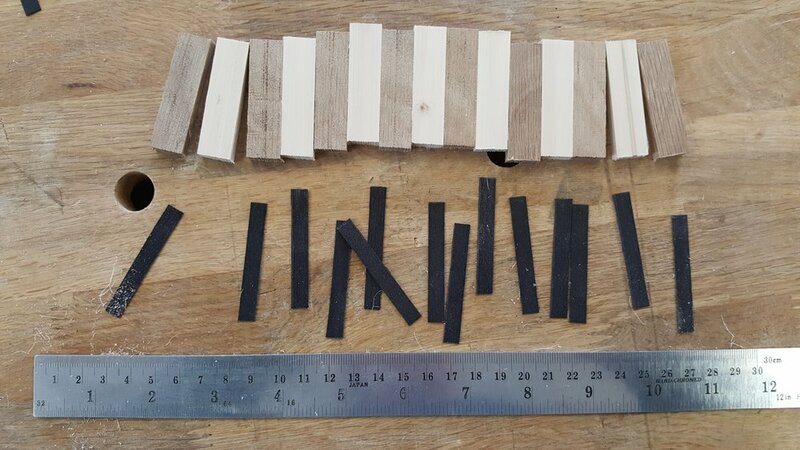 The black pieces are dyed sycamore veneer and will be used between each of the little blocks as shown. Make sure to measure and mark as accurately as possible and then use a scalpel blade to cut the veneers. Do not try to cut through in one stroke, but cut more gently 2 or 3 times and this helps to avoid the grain of the wood splitting in advance of the blade. 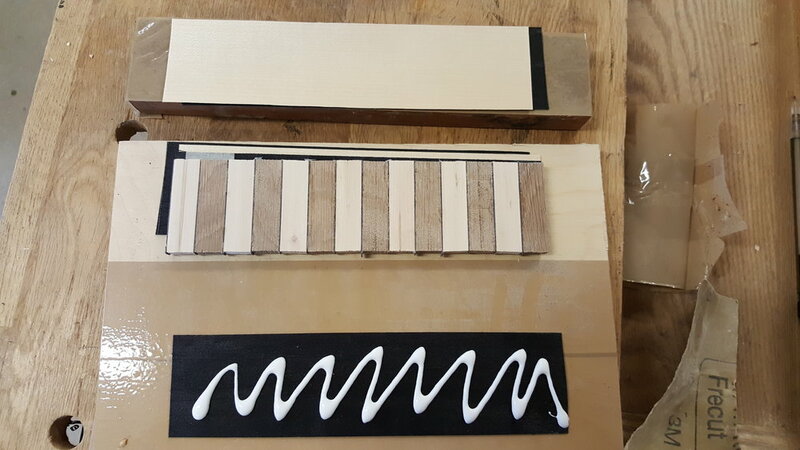 Cut the veneers a hair wider than the thickness of the blocks to make sure that the black line is a full divider between them. Next, it's time to get glueing. Ensure to use packing tape on the working surface to make sure that you don't glue the pieces to your work board. Use a small brush to apply a PVA adhesive. Check the open time of the glue as you need it to stay workable for long enough for you to get to the last piece. If you're not sure, do a time test on some other material. When glue is applied to all parts, use a cam clamp to achieve direct pressure - not too much pressure because you don't want to buckle the sandwich. If you only have screw cramps, make up a little frame and use a wedge to tighten the pieces together. When the glue has dried, very carefully trim off the excess veneer with a sharp chisel, bevel side down. Note the straight lines on the long grain of the oak. This indicates the radial cut. Now it's time to bind the blocks with veneers, grain running in the opposite direction. This ensures that when the finished piece is cut into thin strips that it will not all fall apart. In this case, there is a sandwich of black, white, black to go on both sides. Spread out the glue with a brush, not too much, but enough to see everything covered without too much surplus. Go through this procedure without delay, bearing in mind the open time of the glue and also the distortion of the veneers which are now asking for your immediate attention to be clamped down. Note the use of cam clamps again, providing that vertical pressure required. Screw cramps will turn all your gluey veneers sideways so please avoid them in this case. Also note the packing tape on the clamp caul and the work board. When the glue has dried off, use the low angle block plane to clean the side. Then take your sandwich to the bandsaw and cut thin strips off the long side to produce your inlay. The cut is approx 2.25 mm or less, depending on your project. As you can imagine, the inlay is very delicate so be careful when cleaning saw marks. Build a small jig to hold the inlay steady as you cut the mitres. 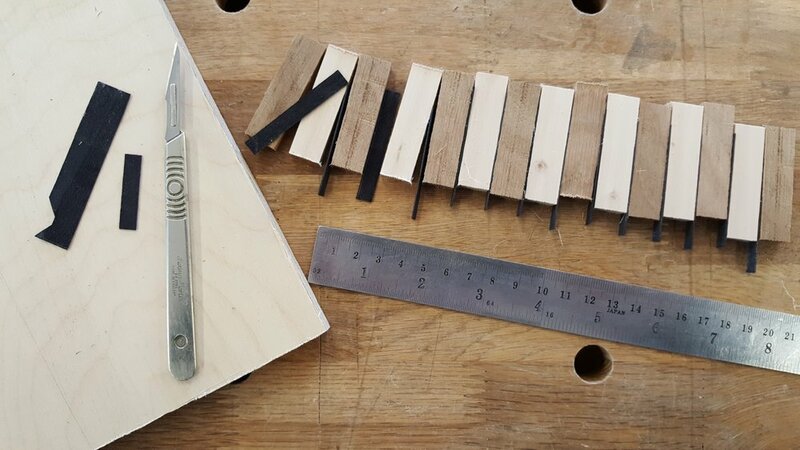 This jig is made from some off cuts, but the top piece has a rebate on the underside and the inlay slips into the jig from the top left but is held firmly in position for cutting. Use a wide and sharp chisel holding flat side to the mitre . Cut ahead of your mark to avoid any risk of breaking close to your end point. Then nibble back to the mark. Note the tiny off cuts to the right. As there was so little hazel, the length of the inlay was short for the front and back of the box. In such a case, it is important to work out the sizes so that the pattern will follow equally around the box. This will require careful planning. The top of the box is veneered with a burr oak, book matched to mirror the grain. Finding a balance between the lengths of inlay, the burr figure and the width of the final border was tricky. When this is achieved, mark some tape with the final measurement to avoid any risk of mistake. There are a couple of different ways to create the space and depth required for inlay and cross bands. 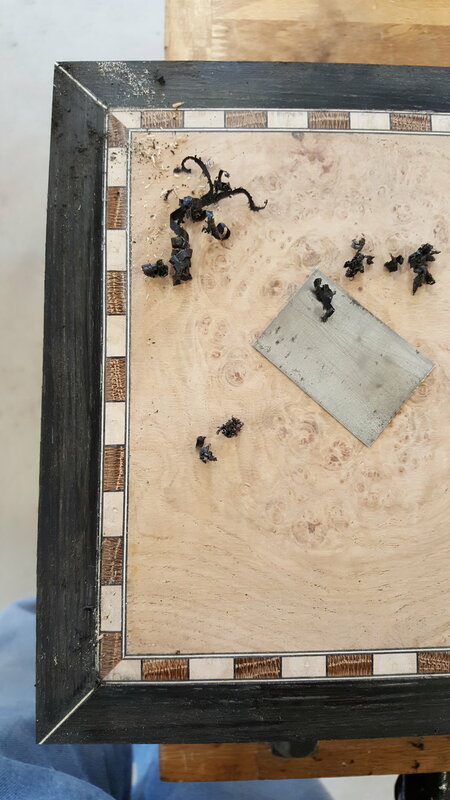 In this project, the easiest method is to take your glued and assembled box to the table saw, lower the blade to the required height, in this case 28 mm, set the fence so that you will only trim the depth / thickness of the inlay off the box. Be careful to remain straight and steady. Next up is the Bog Oak. This piece was trawled out of the bogs in County Roscommon and thought to be about 2500 or so years old. Bog Oak is notorious for cracking if dried too quickly and I have been nurturing this bit for more than a few years. It was small and thin but solid thoughout . Normally, a cross band is made in short grain, but with this piece, the sections would have appeared as tiles. As it was, it had to be joined to achieve the lengths. By way of procedure, the inlay is glued into place first. Be careful to remove unwanted glue beads that may dry and prevent ease of further progress. Use a low tack tape to secure. When that has dried off, glue down the cross band, again using a low tack tape to secure in position. The reason for the low tack tape is that you want to avoid a strong tape that might pull the grain on your piece. After all the glueing, the time has come to clean up the inlay and the top in general. 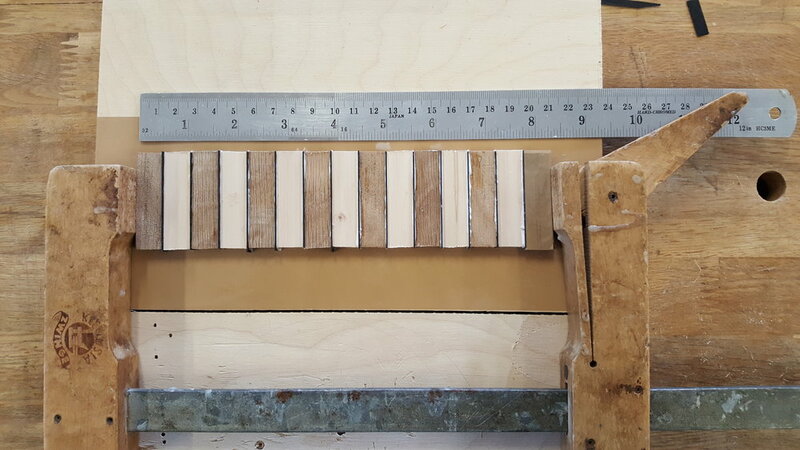 It is important to remember that the figured burr veneer is less than 1 mm in thickness, so go easy or you may destroy it by cutting through to the substrate. To clean the inlay, I prefer a sharp steel scraper. Use this to clean off the inlay and cross band together to achieve a smooth and seamless join between the two. Be mindful when coming to the mitre where the grain changes direction and avoid and unsightly scratch. 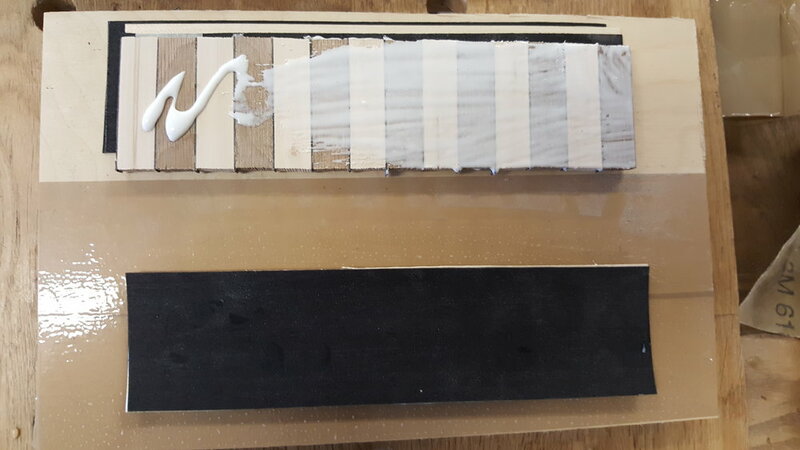 Using 180, 240 and 320 grit papers on a block of wood for support, gently sand the join on the top and of course on the sides too until you feel satisfied that you have achieved the best possible result . This will leave your project ready for finishing.